Ideally located in the prime touristic area of Jomtien Beach, Jomtien Summertime Villa B - 3 Bedroom promises a relaxing and wonderful visit. Offering a variety of facilities and services, the hotel provides all you need for a good night's sleep. To be found at the hotel are daily housekeeping, car park, BBQ facilities, safety deposit boxes. Guestrooms are fitted with all the amenities you need for a good night's sleep. In some of the rooms, guests can find closet, clothes rack, television LCD/plasma screen, sofa, mirror. Entertain the hotel's recreational facilities, including outdoor pool, solarium. 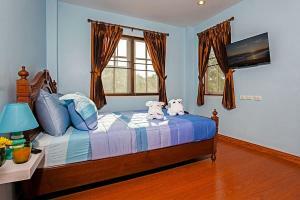 Discover all Pattaya has to offer by making Jomtien Summertime Villa B - 3 Bedroom your base.